I wanted to make these for St. Patrick’s Day–dyed green, of course–but didn’t get around to it until today. Now, it is tricky to find a recipe for Apple-Blueberry muffins, and after trying two with very unsatisfactory results, I decided to kind of wing it. I used Janssen’s recipe for Blueberry Banana muffins as a base, and made up the rest as I went, jotting down notes so I could replicate it here for you all. You’re welcome. Mix butter, sugars and applesauce together until creamy, add eggs and vanilla. Sift flour, salt, soda and cinnamon, dump into sugar mixture with pulverized oats and mix. Mix in apples and milk, fold in blueberries. Line 2 muffin tins with paper liners (or spray with cooking spray), spoon in batter filling each cup about 2/3 full, and bake for 20-25 minutes. 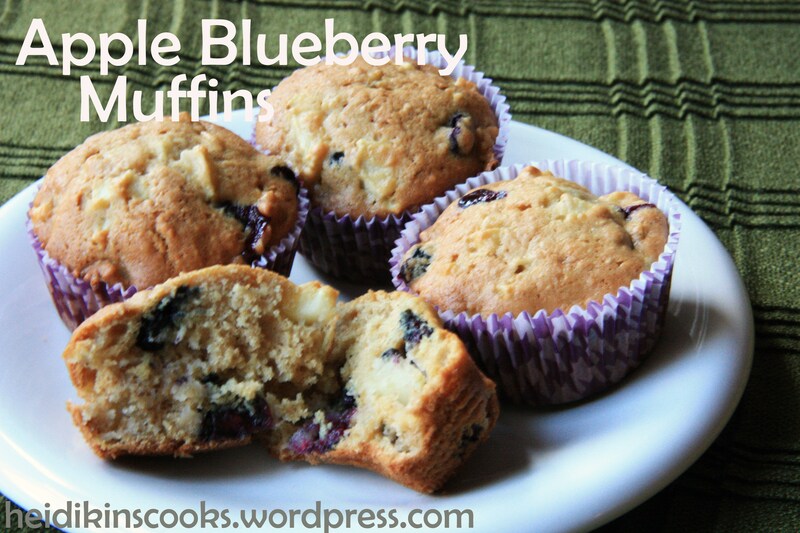 Nothing beats freshly baked blueberry muffins with cold butter- yum! . Gotta rescue those fruits and try this recipe.